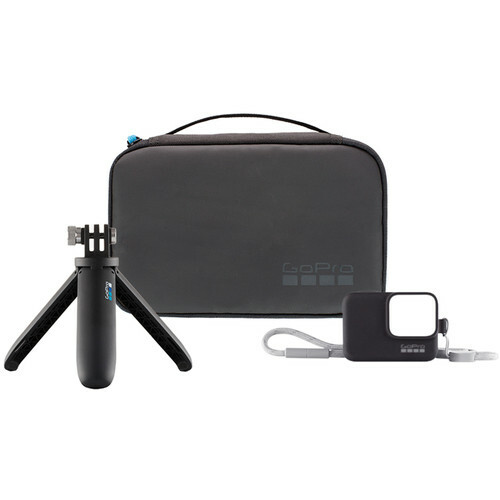 For your trips, vacations, and other journeys, the GoPro Travel Kit includes the Shorty Mini Extension Pole + Tripod and the Sleeve + Lanyard, which between them will let you conveniently capture handheld shots and selfies, as well as simply let your GoPro freely but securely hang from your wrist or around your neck and be available for easy access at any moment. A customizable compact carry case is included for neatly storing everything. The Shorty supports all GoPros while the Sleeve + Lanyard is compatible with the HERO7, 6, 5, and 2018. Box Dimensions (LxWxH) 8.4 x 5.4 x 2.11"
Travel Kit is rated 5.0 out of 5 by 1. Rated 5 out of 5 by A from GoPro Travel Kit Everything I expected at a great price.